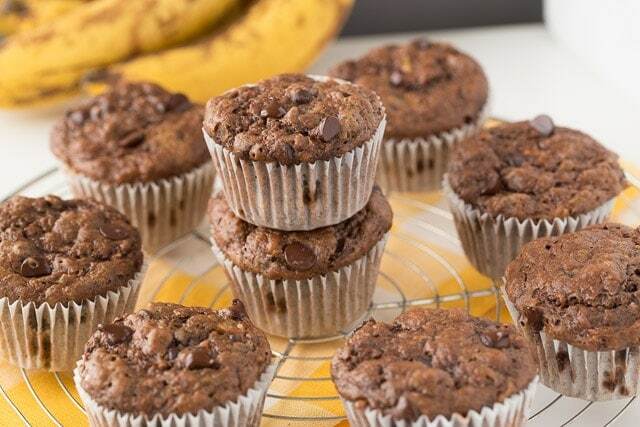 Healthy Chunky Monkey Muffins made with greek yogurt, bananas and dark chocolate chips. Delicious way to pack in protein, potassium, and minerals! So what makes these muffins healthier than normal? 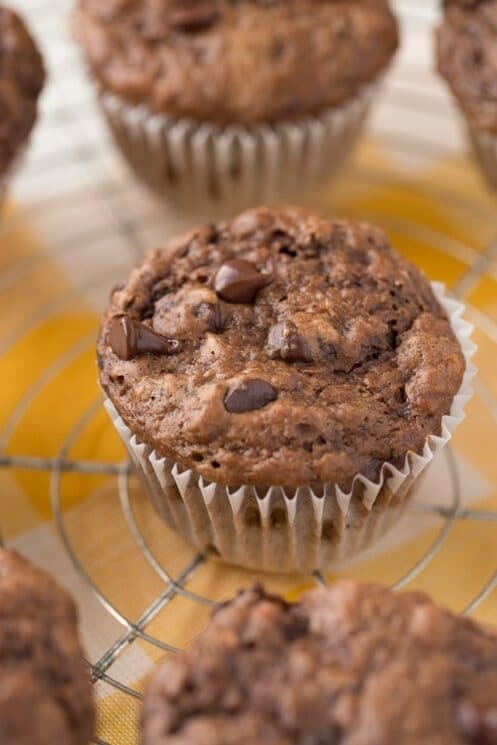 Well, using whole wheat flour, bananas, greek yogurt and dark chocolate chips! Lets talk for a minute about the health benefits of these ingredients for your kids. Regulates Bowel Movements-Bananas contain pectin which is a soluble fiber that helps to regulate bowel movements. Kids who suffer from constipation can benefit from eating bananas. Better Brain Power -Some research has shown that children who eat bananas on a regular basis perform better in school. Healthy Bones -High Potassium content in bananas help to neutralize the high amounts of sodium in our diet. This prevents the weakening of bones. Muscle Performance – Bananas are high in potassium which helps prevent muscle cramping. Kids who are very active and involved in sports or other highly intense physical activities should eat bananas regularly before or after events. Natural Energy – Bananas contain three types of natural sugars-Glucose,Fructose and Sucrose .When combined with fiber, these natural sugars provide instant and substantial energy to our body. Protein Power – Protein is vital to cell growth, building muscle, and repairing tissue and maintaining immune system. Kids are growing quickly and constantly building new cells. Protein gives kids the amino acids needed to keep up with all the healthy growth! Probiotics – The idea behind probiotics is to boost the kind of helpful bacteria in the body that can destroy harmful bacteria and reduce infection. Strong Bones – We only get one chance to build strong bones — when we’re kids and teens. Children who get enough calcium start their adult lives with the strongest bones possible. That protects them against bone loss later in life. 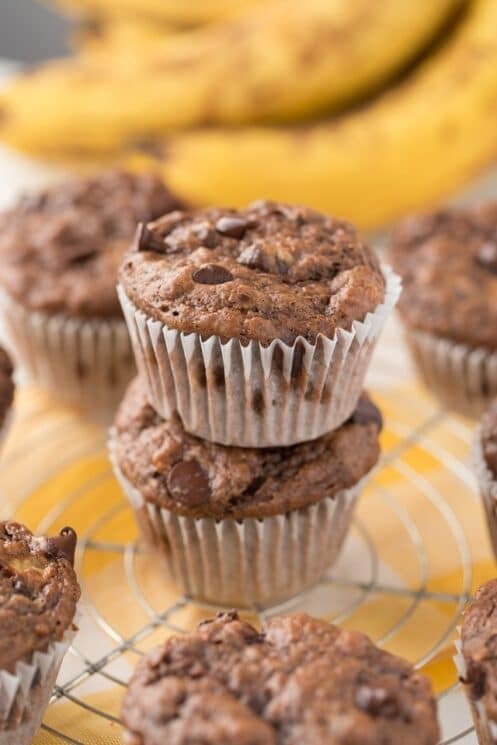 In this recipe, t28he bananas and greek yogurt replace any added fat like oils or butter. The greek yogurt adds protein and calcium. Dark chocolate chips are considered to be an antioxidant-rich superfood and have several other benefits. 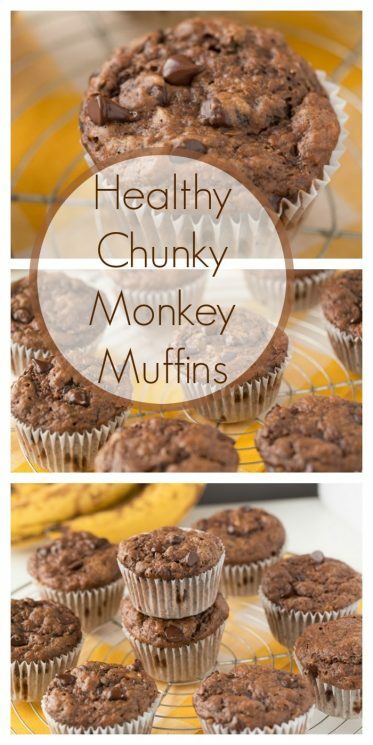 I love these muffins because sometimes I’m just craving something sweet and instead of reaching for overly processed cookies from the grocery store I can whip up a batch of these Chunky Monkey Muffins! There’s one biiiiig trick to making muffins. Don’t over-mix the batter! When you add the dry ingredients just stir until barely combined. 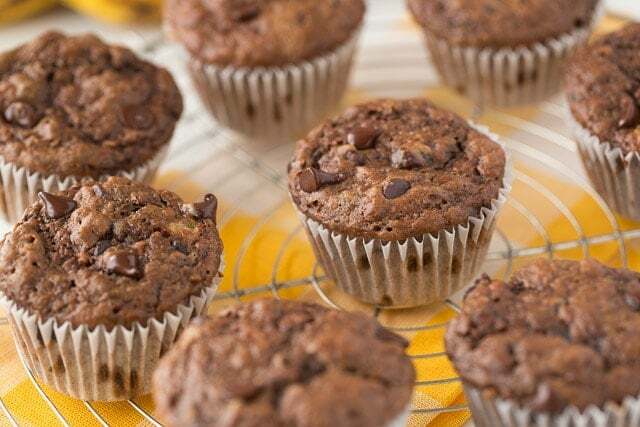 If you stir the batter too much the muffins will end up with a tough texture. The second trick is to make sure your eggs are always at room temperature. This helps the ingredients to combine evenly. This trick is really important when the recipe you’re using has either coconut oil or butter, cold eggs can solidify those ingredients on contact. One of our most popular recipes is our Sweet Spinach Muffins! There’s a reason they’ve been pinned thousands of times and people just can’t get enough of them. The bananas in the recipe (and this one) is the secret to keeping them super sweet and moist. Preheat oven to 350 degrees and grease muffin tins or line with cupcake liners. In a large bowl, add bananas and mash well. Add eggs, greek yogurt, milk, honey, and vanilla. Stir well. In a separate bowl whisk together flour, cocoa powder, baking soda and salt. Add dry ingredients and chocolate chips to the wet mixture; stir just until combined. Avoid over mixing. Fill muffin tins evenly (should make 12 muffins) and bake for 25-30 minutes. Can’t wait to try this one! I intend to make them in the form of mini muffins. What should I keep in mind? The baking time is the only thing to watch! They’ll take less time but I can’t say how much depending on your oven and the size of your minis it can vary! Can you make these with regular milk instead of almond milk? My son has nut allergies! Could you suggest an alternative flour? Could I use chick pea or quinoa flour? Followed precisely but unfortunately would not cook through. I think mixture was too wet and also stuck to well -greased sides. Had to throw it all away ???? I’m so sorry – we have made them lots of times with no trouble. I would be curious if any ingredients are different because it looks like you are in the UK? Should I use plain Greek yogurt or vanilla flavored? Is the Greek Yogurt full fat or 0%? Does that matter? Thanks! It is totally a preference – won’t effect the recipe. I’m adding these to my “to make” list as other SHK recipes have been a big hit with our young toddler! I have a question about the banana fact above. Our pediatrician has told us to avoid bananas for our LO since she tends to get constipated very easily. This isn’t the first clinician we’ve heard this from. I’d love to know the source of your banana fact, so I can do a little research. Our toddler LOVES bananas and I feel badly telling her that she can’t have them since they are such a heathy snack/breakfast treat. Made them according to the recipe and they came out flat and did not cook through. I put them back in the oven and they still wouldn’t fully cook through. Taste was good, but may need a bit of tweaking since I see some reviewers had the same issue? I have made these today and they tasted good. The only issue I have is that the muffins are stucked to the paper I use.. Do you know what went wrong? Have made these multiple times even though there are no kids in the house! Delish!!!!!!!!!! Only thing different was to us unsweetened cashew milk and maple syrup! Love this recipe! I don’t write reviews often, but felt compelled this time because these really are GREAT. 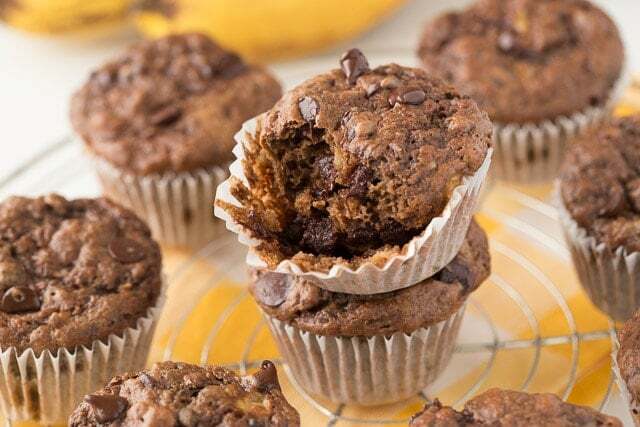 Particularly when you take the advice in the article to use room temperature eggs and not to over-whip the batter – makes all the difference and results in a great texture and – ‘healthier’-tasting, yes, but nonetheless – light, flavourful and popular muffin in this household. I make and bake healthy food all the time for my kids, and these stand out in my ever-growing recipe pile as something special. Thank you!! Thanks for the recipe! Just made a batch and they were good. My picky toddler though wont eat them when he saw the small pieces of banana. Next time I’ll make them, I’ll just throw the bananas in the blender to completely hide them. The other issue I had is that they got stuck to the liners . What can I do next time to avoid that? You can use silicone liners, or just spray your pan and not use liners at all. Also, we have tried parchment liners that work great! I’m in the UK and made these today and they turned out well. Sprayed silicon muffin cases with sunflower spray first and cooked for approx 27 mins at approx 180 in fan oven. Plain Greek yogurt or vanilla? Do you know if there is a high altitude substitution? No subs! We are also at high altitude and plain! Can something be used in place of the yogurt to make these dairy free? I had the same issue as everyone else. They were so wet, they did not rise and are flat. Ive had to throw mine out too, they’re just a soggy mess. Really frustrating as we specifically went to the shops to make these and they turned out not great. 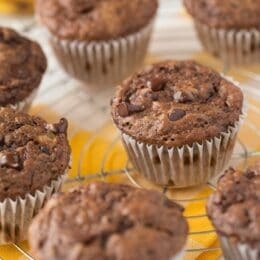 I made this once before and they were the best healthy muffins I’ve ever made. I’ve come back to make it today and I think some measurements are wrong in the list. It says 3/2 cups flour and 3/2 teaspoons taking soda.. I just guessed it was 2 cups and 2 teaspoons I hope it’s right. Thanks for the recipe though love it! Hi Emma, sorry for the confusion! We had some glitches to our recipes following a big update to our site last weekend. The amounts should look normal to you now. Thanks for your patience! Hi Karishma! You can substitute any other milk (dairy milk, soy milk, etc.) for the almond milk in this recipe.